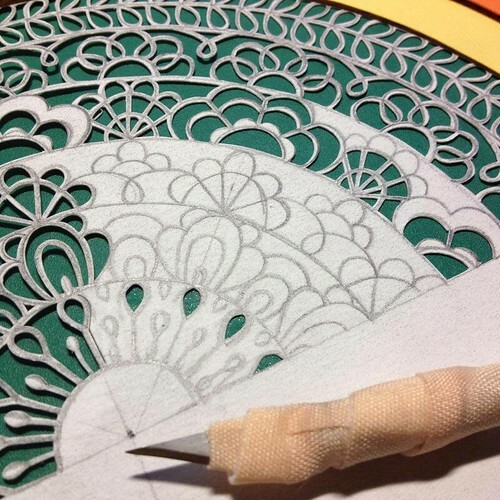 There's no question that paper cutting posts are some of the most popular here on ATP. Today I'd like to introduce Charlotte Trimm of By Charlie's Hand. 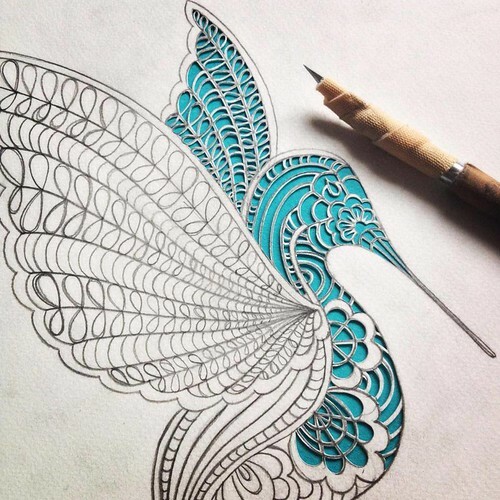 I first saw her work when Lisa Isaacs of Handmade in Israel mentioned being inspired by it - I can certainly see why, as each art piece Charlie creates is beautifully detailed! She opened her Folksy shop in 2011 after graduating with a BA (Hons) Fine Art degree from University of Wales in 2010. 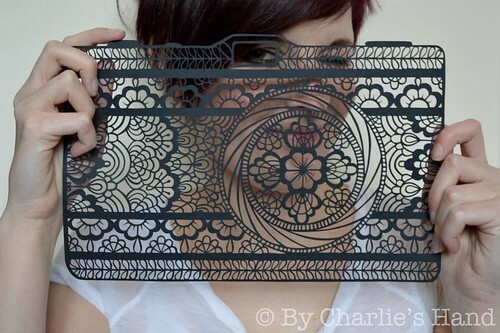 Charlie mainly painted during her degree however, and didn't begin paper cutting until December of that year. She cites popular paper cut artist Rob Ryan as an influence, and quickly found how much she enjoys the process of paper cutting. One very important reason why Charlie's paper cuttings sell so well (besides being gorgeous, of course) is that she works hard to cultivate a Facebook following. I think I have been incredibly lucky with my success so far and I wouldn't be where I am today without my Facebook page [edit: no longer available] as I have a huge audience and can reach many potential customers so quickly and easily. It has been a powerful part of what I do. Considering I started the page simply so my new experiments in papercutting weren't cluttering up my personal news feed and annoying all my friends, it's turned out to be so much more! Charlie frequently updates the page with progress shots, and draws people in with conversation about making mailing tube-laden trips to the post office and other glimpses into her everyday life. 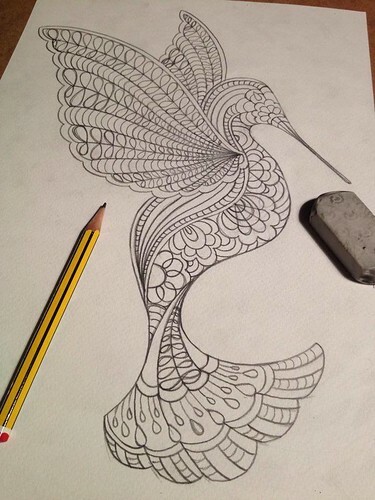 Each art piece begins with a pencil drawing on 140-160 gsm paper, followed by the methodical cutting of the design. Her scalpel is wrapped to save wear and tear on fingers and she mentions buying blades 250 or 500 at a time! Needless to say, a very sharp blade is key to such fine work. My favorite of her designs would have to be the Dandelion Clock, no doubt because of the symmetrical, intricate cuts - I can't image how she makes all those perfectly straight lines. I'm also intrigued by the name. Dandelions - oh, I'm familiar with those, especially at this time of year - it's the clock bit that is new to me... must be a Briticism and is a likeable one I'm adopting from now on. 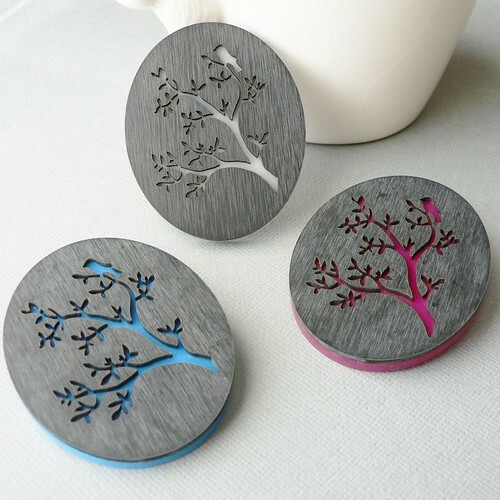 Charlie is open to collaborations as evidenced by these lovely brooches. In 2012, Molly Ginnelly of Molly Ginnelly Jewellery created Perspex laser cut necklaces and pins that featured several of Charlie's designs. 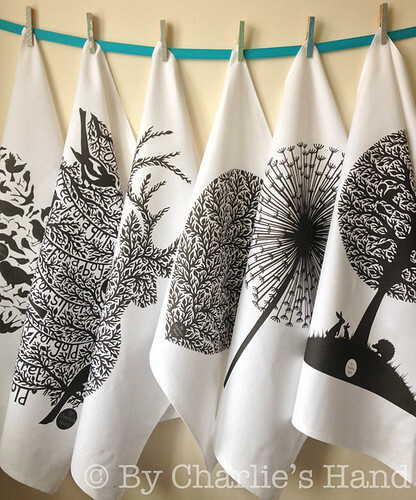 Charlie is booked up with commissioned paper cuttings through September, but giclée prints, greeting cards, and silk screened tea towels and totes that feature the designs you see here plus more, are available via By Charlie's Hand. Charlie's work is stunning, isn't it? Glad that I was able to introduce you :) Thanks for the mention too. Yes, it is! And you're welcome - I'm so glad to have learned of her work via your site, Lisa. Unbelievably beautiful, what an eye and hand she has! Thanks for sharing. Espetacular este trabalho vou tentar fazer algo parecido mas mais simples. 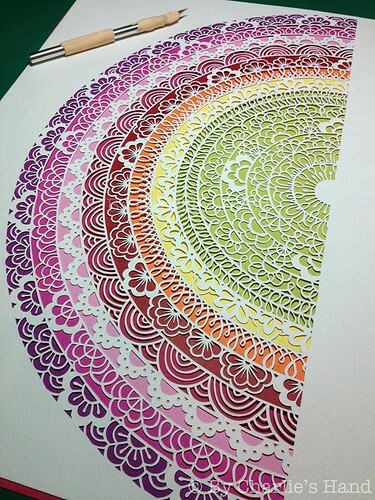 What is it about hand paper cutting that keeps me admiring it time after time? It's so mesmerizing! Beautiful! I just bought a new knife and I'm excited to try it out. I'm thinking about making my first ever papercut gift for a friends birthday...though I may be a little ambitious since it's next week! We'll see. :) Thanks for sharing Charlie's work, Ann. It's inspiring! Go for it, Casey! Handmade gifts are the best and I know you can make something beautiful. Your work is amazing. So much detail. Beautiful, just simply beautiful. 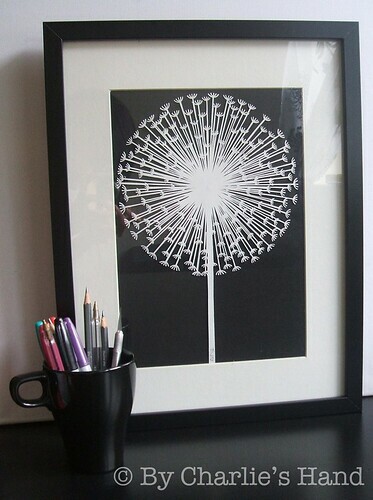 So intricate .Dandelion clock looks unbelievably perfect!!!. WOW. These pieces are totally outstanding! Wow these are amazing! Such skill!